The tubing coiling machine, for making coiled plastic tubing sets. The coiler consists of tubing handling equipment, an electric rotary table, and plastic tubing cutting and plastic tubing taping mechanism. This plastic medical tubing hanking machine will require one part time operator. The tube coiler, is cleanroom compatible, fully safety guarded. The plastic medical tubing will be banded with cohesive tape - medical grade. Touch screen control for all tubing coiling and hanking parameters, such as a menu for length of tubing cuts. Powered tubing dereeler/banding unwind built in. Plastic medical tubing dimensions .01” to .5” in diameter. Fully automatic unattended hanking operation. 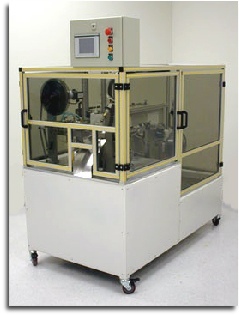 Tube coiling machine rates dependent on length of tubing to be coiled – 5 to 15 plastic medical tubing coils per minute. This tubing coiling machine can be modified so that it will impart a permanent coil to the plastic medical tubing. A formed tubing coil can be achieved by solvent bonding the plastic tubing into a formed coil. Another approach would be to heat set a permanent shape into the plastic medical tubing to form a coil. Tube coiler - machinery for producing coiled tubing sets, ideal for plastic tubing coiling and medical tubing sets, such as IV lines.